CONCORD, NC - AAPCO Owner and CEO, Chip Dobner, sponsored a trip made by a group of AAPCO employees and members of Dobner's church congregation to Guatemala in late March. The purpose of the trip was to help set up free clinics in remote areas where villagers could be examined by doctors. 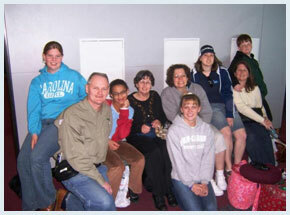 AAPCO associates on the trip were Chip's wife, Stephanie Dobner, and Marlena Dixon. Stephanie and Chip's son, Chuck Dobner, and six members of the Showers of Blessing Church in Concord made up the rest of the team. They were joined by members of a Guatemalan church and two local doctors on the 8-day trip. "This trip is very much in line with our company's mission to reach out and help hurting people," said Chip Dobner. "We're a Christian-based company and we feel like we should give back to the communities we serve and beyond." This is a mission Dobner takes very seriously. In 2000 he made the decision to pursue pastoral ministry and started a local congregation. In 2002 he turned the day-to-day operations of AAPCO over to his brother Stan to pursue his ministry full-time. "We're thankful for the efforts of our AAPCO team and the members of the church for giving their time," added Dobner. 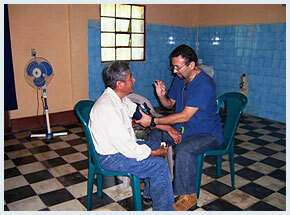 "In addition to giving the villagers some needed medical attention, missionaries were also able to share the gospel. We're excited to have helped lead 58 adult villagers and several children to the Lord."